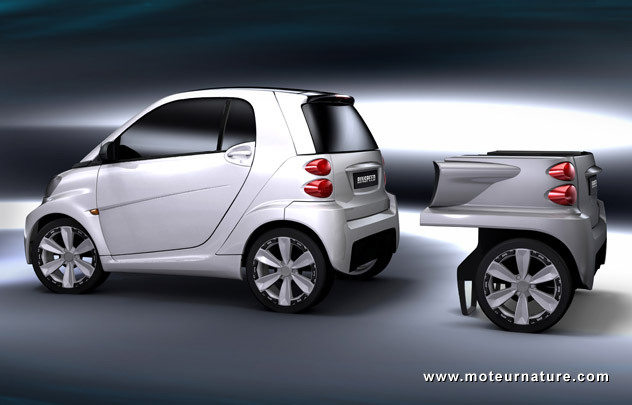 The electric Smart car has a 17.7-kWh battery pack giving a 85-mile range. Not enough for some people, so Rinspeed, the famous Swiss coachbuilder and boutique car manufacturer, got an idea to improve that. A trailer. 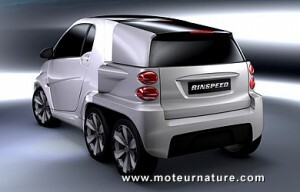 This is not a new idea, AC Propulsion pioneered it some 15 years ago, but we expect Rinspeed’s trailer to be particularly well-built. Also, it offers the choice to host different technologies. An extra set of batteries, a small ICE with a generator or even a fuel cell. It’s up to the customer to say what he wants. The only drawback is that the range-extending device is also car-extending. The car will be a bit less easy to drive, but about the about the joy of driving the shortest six-wheeler ever made?